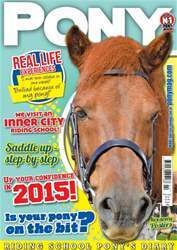 February PONY Mag is HERE! Learn all about what it means to have a pony on the bit and how to achieve it, how to boost your confidence in 2015, and what it's like having ponies in the middle of London! PLUS check out PONY readers' real life experiences, cringey fess-ups and a new PONY Academy paper!